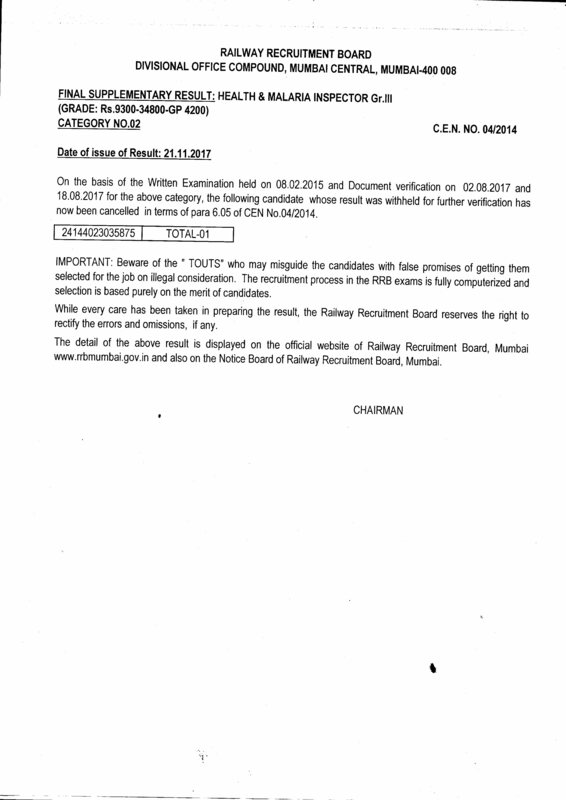 Railway Recruitment Board (RRB), Mumbai functions under the Ministry of Railways, Government of India. It is primarily responsible for recruiting the group 'C' staff. 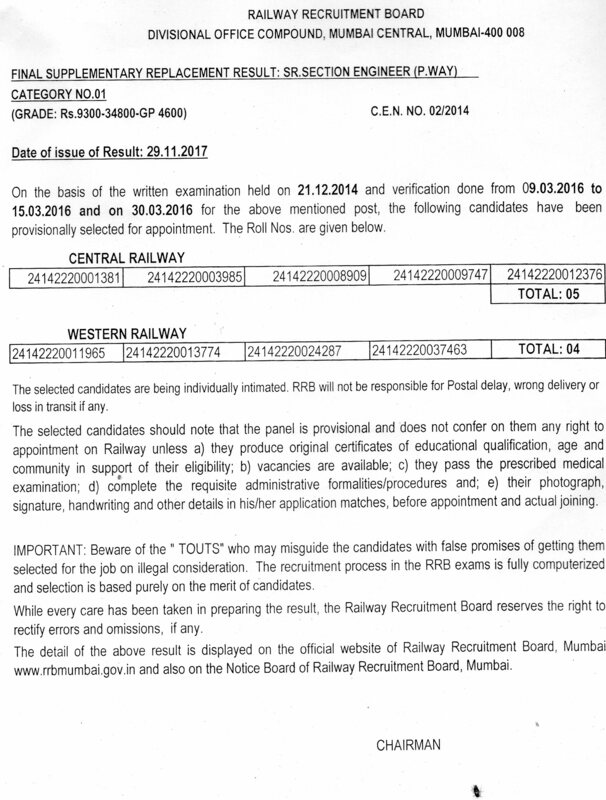 Railway Recruitment Board, Mumbai, is carrying out recruitment for Mumbai Division & HQ of Western Railway, and Mumbai, Nagpur, Solapur, Pune, Bhusawal Division and HQ of Central Railway, Nanded Division of South Central Railway and Nagpur Division of South East Central Railway. Earlier RRB Mumbai (then Known as Railway Service Commission) was located at Churchgate. In February 1986 it was shifted to Mumbai Central. The RRB building at Mumbai Central has been rebuilt in October 2000. CLICK HERE TO VIEW QUESTION PAPER, RESPONSES, FINAL KEYS, SCORE SHEET AND SHORTLISTING STATUS FOR PHYSICAL EXAMINATION TEST (PET) . Click here to view Indicative Notice for Four Employment Notices for various posts in Railways. CLICK HERE TO VIEW QUESTION PAPER, RESPONSES AND KEYS & RAISING OF OBJECTIONS IF ANY TO QUESTIONS / OPTIONS / KEYS . CLICK HERE FOR NOTICE DATED 11.1.2019 REGARDING ABOVE ..
Login to view your 2nd Stage e-Call letter, Exam date and city intimation details, Travel pass, 1st Stage Score and 1st Stage question paper . The Application fee refund transaction initiated by the RRBs is still under progress and is likely to be completed for all candidates by 20-12-18. Accordingly, the link for correction of Bank Account details for the candidates whose refund transaction has failed will be live from 21-12-18. CLICK HERE FOR NOTICE DATED 12.11.2018 REGARDING REPRESENTATIONS ON PROVISIONAL SHORTLIST AND EXAM DATES FOR SECOND STAGE CBT. CLICK HERE FOR HELP DESK FOR CANDIDATES TO RAISE QUERIES.
" Trackman-How they work in Indian Railways"
"Candidates may please note that the video circulating on social media about an examination in Bhagalpur centre of Bihar does not pertain to RRB Group D Exam. 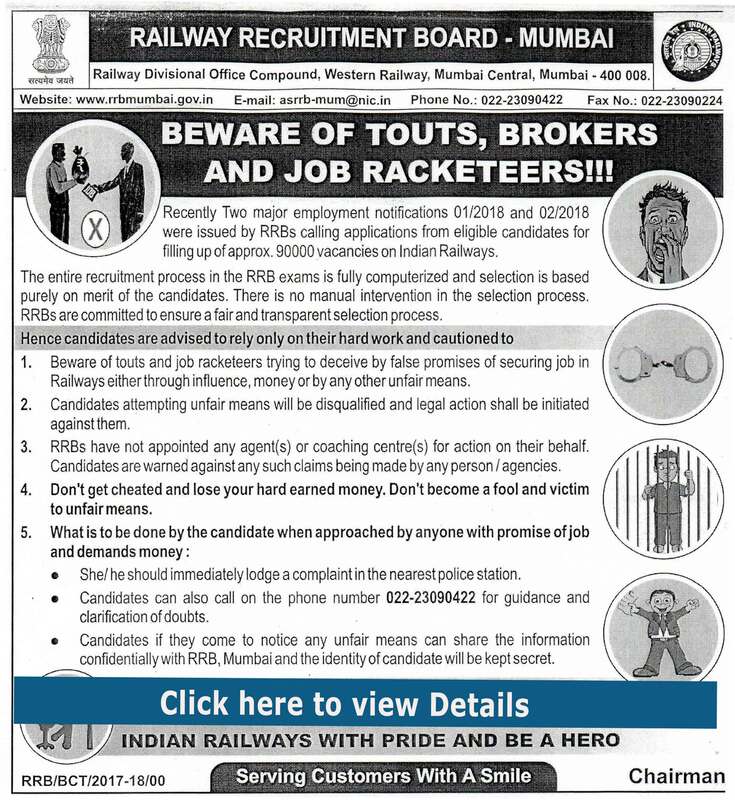 RRB conducts exam in a secure, professional and transparent manner. Do not get misguided by any such misinformation on social media and rely only on information published on the official websites of RRBs . " CLICK HERE TO DOWNLOAD E-CALL LETTER, EXAM CITY & DATE ADVICE AND SC/ST TRAVEL AUTHORITY. First stage CBT for ALP & Technicians shall be conducted on 17.08.18 in all the three shifts as scheduled. CLICK HERE TO VIEW IMPORTANT NOTICE REGARDING E-CALL LETTER DOWNLOAD. CLICK HERE TO VIEW NOTICE REGARDING EXAM LANGUAGE FOR 1st STAGE COMPUTER BASED TEST (CBT). CLICK HERE TO VIEW NOTICE REGARDING INCREASE IN VACANCIES. CLICK HERE TO VIEW SECTION WISE MARKS FOR 1st STAGE COMPUTER BASED TEST (CBT). Click here to view important notice regarding modification of invalid photographs. Click here to view important notice regarding invalid photographs. CLICK HERE TO CHECK APPLICATION STATUS OF CEN 02 / 2018 FOR THE VARIOUS POSTS IN LEVEL 1 OF 7th CPC PAY MATRIX . LINK IS LIVE FROM 12.00 HRS OF 11.7.2018 TO 23.59 HRS OF 20.7.2018 . CLICK HERE TO CHECK APPLICATION STATUS OF CEN 01 / 2018 FOR THE POST OF ASSISTANT LOCO PILOT AND VARIOUS POSTS OF TECHNICIANS . LINK IS LIVE FROM 12.00 HRS OF 11.7.2018 TO 23.59 HRS OF 20.7.2018 . Click here to view the Supplementary Result (Date 30.04.2018) in one page (01) against CEN. No.01'2014, for the post of Assistant Loco Pilot, Cat. 01 against CEN No. 01/2014 declared. Click here to view the Supplementary Replacement Result in two pages(02) against CEN No. 01/2014, for the post of Assistant Loco Pilot, Cat. 01 against CEN No. 01/2014 declared. Click here to view the Supplementary Result in one page(01) against CEN No. 01/2014, for the post of Assistant Loco Pilot, Cat. 01 against CEN No. 01/2014 declared. CLICK HERE TO VIEW INSTRUCTIONS DATED 06.04.2018 (IN 06 PAGES) FOR SKILL TEST (STENOGRAPHY TEST) HINDI & ENGLISH - CATEGORY NO. 01 & 2. Few candidates have reported that due to slow speed of application page of CEN 01/2018- (Assistant Loco Pilot- ALP & Technician), they could not register or make the payment on 30.03.2018. These reports are being looked into. In the mean while, the online payment gateway for CEN1/2018 shall remain open on 31.03.2018 also till 22.00hrs. Final Result in one page(01) against CEN No. 01/2014, for the post of Technician Gr.III Riveter, Cat. No. 94 declared. Click here to view result. Final Supplementary Result in one page(01) against CEN No. 04/2014, for the post of Staff Nurse, Cat. No. 01 declared. 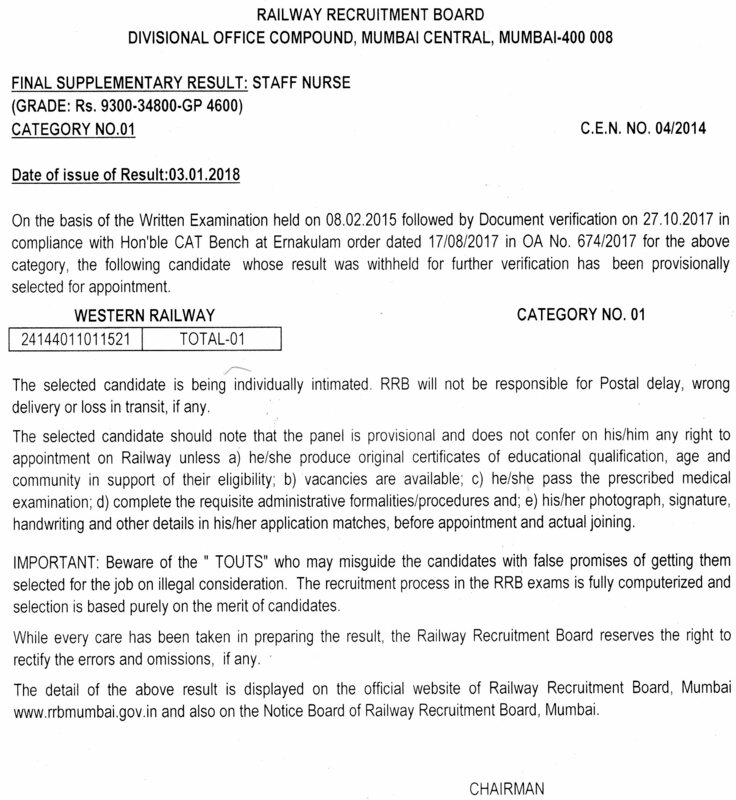 FINAL RESULT IN 02 ( TWO ) PAGES AGAINST CEN 01/2014 FOR THE BALANCE VACANCIES OF ASSISTANT LOCO PILOT AFTER DOCUMENT VERIFICATION PHASE - II DECLARED . Final Result in 17 (SEVENTEEN ) Pages aginst CEN 01/2014 for the Post of Assistant Loco Pilot and Technician Categories After Document Verification PHASE -III Declared . Date and Time of Closing: 05/03/2018 23.59 hrs. Final Supplementary Replacement Result in one page(01) against CEN No. 02/2014, for the post of Sr. Section Engineer, Carriage & Wagon Cat. No. 10 declared. Final Supplementary Replacement Result in one page(01) against CEN No. 02/2014, for the post of Jr. Engineer Electrical/Electrical General & Depot Material Superintendent Cat. No. 56 & 76 declared. Final Supplementary Result in one page(01) against CEN No. 04/2014, for the post of Staff Nurse ( Cat. No. 01) declared. Final Supplementary Replacement Result in one page(01) against CEN No. 01/2015, for the post of Sr. Section Engineer (TMC) Cat. No. 24 declared. Final Supplementary Replacement Result in one page(01) against CEN No. 02/2014, for the post of Sr. Section Engineer (P.Way) Cat. No. 01 declared. Final Supplementary Replacement Result in one page(01) against CEN No. 02/2014, for the post of Junior Engineer Group Cat. Nos. 36, 39 & 71 declared. FINAL RESULT IN TWENTY TWO (22) PAGES AGAINST CEN 03/2015 FOR NTPC (GRADUATE) POSTS DECLARED. Final Supplementary Result in one page(01) against CEN No. 04/2014, for the post of Health & Malaria Inspector Gr.III (Cat. No. 02), declared. Final Supplementary Result in one page(01) against CEN No. 04/2014, for the post of Staff Nurse (Cat. No. 01), Health & Malaria Inspector Gr. III (Cat. No. 02) and Radiographer (Cat. No. 05) declared. Final Supplementary Replacement Result in one page(01) against CEN No. 02/2014, for the post of Jr. Engineer (Loco) Cat. No. 52, declared. Click here to view result. CLICK HERE TO VIEW 2ND DOCUMENT VERIFICATION DATE FOR CANDIDATES ABSENT DURING 1ST DOCUMENT VERIFICATION FROM 29.09.2017 TO 10.10.2017. Notice dated 10.10.2017 for result against CEN 01/2014. for Candidates who were absent during 1st Document Verification from 21.09.2017 TO 28.09.2017. Final Result in one page(01) against CEN No. 03/2014, for the post of Staff & Welfare Inspector(Cat No. 05) declared. Click Here To View Result.. Final Result in three pages(03) against CEN No. 04/2014, for the post of Staff Nurse (Cat. No. 01), Health & Malaria Inspector Gr.III (Cat. No. 2) and Pharmacist Gr.III (Cat No. 03) declared. CLICK HERE TO VIEW 2ND DOUCMENT VERIFICATION DATE FOR CANDIDATES WHO WERE ABSENT DURING 1ST DOCUMENT VERIFICATION FROM 12.09.2017 TO 20.09.2017. CLICK HERE TO VIEW 2ND DOUCMENT VERIFICATION DATE FOR CANDIDATES WHO WERE ABSENT DURING 1ST DOCUMENT VERIFICATION FROM 28.08.2017 TO 11.09.2017. Final Result in three pages(03) against CEN No. 04/2014, for the post of Radiographer, X-Ray Technician, Lab. Assistant Gr. II, Lab. Superintendant Gr.III, Haemo Dialysis Technician, Physiotherapist, District Extention Educator and Cath. Lab. Technician, Cat. No. 5, 19, 06, 07, 08, 11, 12, & 20 declared. Cat. No.3, 14 & 47 declared. For other categories result will be declared subsequently. The portal will be live up to 10.10.2017 (23:55 hrs). CLICK HERE TO VIEW THE DATES ( BATCH WISE ) AND INSTRUCTIONS FOR DOCUMENT VERIFICATION (PHASE-III) IN 3 (THREE) PAGES FOR TECHNICIAN CATEGORIES CEN 01/2014. CLICK HERE TO VIEW THE RESULT DATED 02.8.2017 FOR CALLING CANDIDATES FOR DOCUMENT VERIFICATION ( PHASE -III ) IN 23 ( TWENTY THREE ) PAGES FOR TECHNICIAN CATEGORIES CEN 01/2014. Result in 14 (FOURTEEN) pages for DOCUMENT VERIFICATION for various NTPC (GRADUATE ) POSTS against CEN 03/2015 DECLARED. 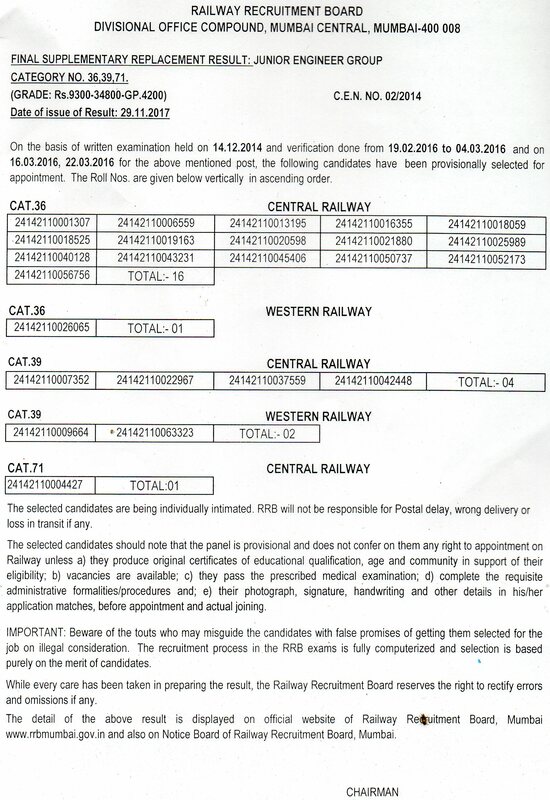 Several candidates are approaching various RRBs and Railway Board through phone calls, SMSs, e-mails and other social media platforms enquiring about the likely date of results of NTPC (Graduate) Examinations against CEN-03/2015. It may be noted that the Typing Skill Test and Aptitude Test has been held in Computer Based Test mode for the first time in history of Indian Railways on 29/06/2017 and 30/06/2017 respectively. The results are being scrutinized critically and are being processed and will have to be interpolated with the results of 2nd Stage CBT for formation of merit for calling candidates for document verification. The list of shortlisted candidates for verification of documents and genuineness of candidature along with scheduled dates is likely to be ready by 1st week of August, 2017. Candidates are again advised to keep on visiting the authentic RRBs’ websites at regular intervals for the updates in this regard. RESULT IN 10 (TEN) PAGES FOR CALLING CANDIDATES FOR DOCUMENT VERIFICATION OR INTERVIEW & DOCUMENT VERIFICATION (AS APPLICABLE) DECLARED . Click here toview, download and print the Transcripts of the Typing Skill Tests. The transcripts of Typing Skill Test held on 29.06.2017 will be available on RRB-Mumbai website w.e.f 07.07.2017 (17.00 hrs.) to 13.07.2017 (23.59 hrs.). 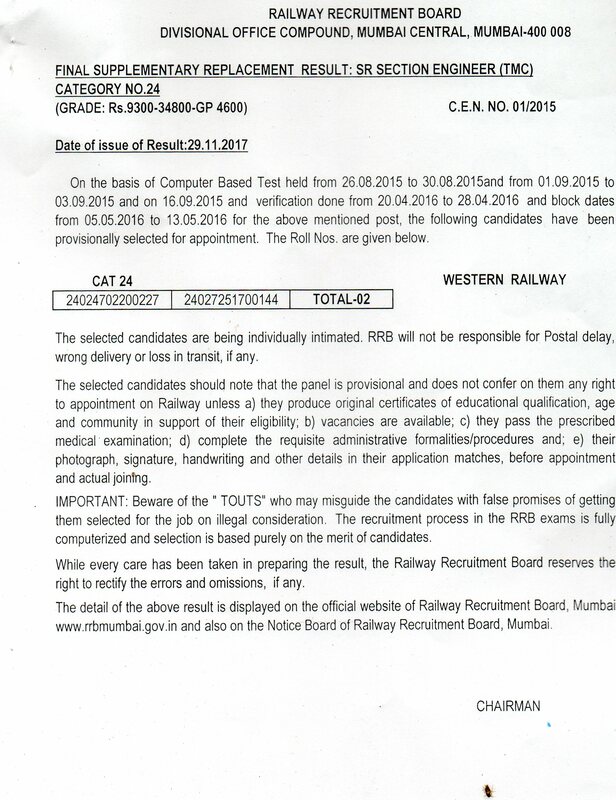 The candidates who appeared in the test may visit RRB-Mumbai's website to view, download and print their transcripts. Notice for result against CEN 01/2014. Click here to view Notice. The revised link to view individual score card of 1st stage Exam of NTPC (Graduate) against CEN-03/2015. The link provided earlier for this purpose has been revised below due to technical reasons. Result for Document Verification (Phase -II) for ALP & Technician categories against CEN 01 / 2014 declared in total 17 pages. Candidates to read carefully instructions given in Page 1, Page 16 and Page 17.